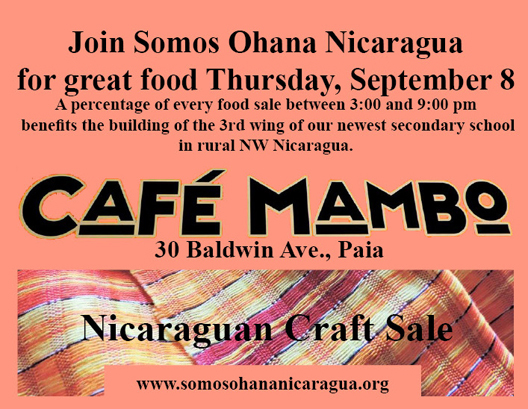 On Thursday, Sept. 8, Café Mambo will host Somos Ohana Nicaragua for a dining fundraiser and sale of Nicaraguan crafts newly arrived with the volunteers of this summer’s team in Nicaragua. 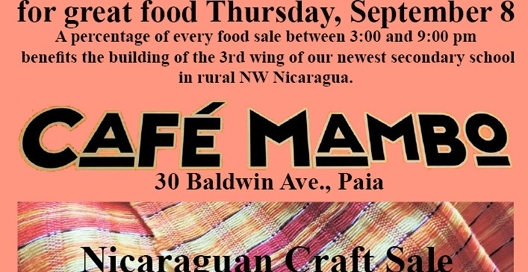 A percentage of every food sale between 3:00 and 9:00 pm, and all proceeds of the craft sales, will benefit the building of the 3rd wing of the group’s newest secondary school in La Carreta which the group has constructed in rural northwest Nicaragua, Café Mambo is at 30 Baldwin Ave., in Paia. The Maui volunteers of Somos Ohana Nicaragua have just returned from their annual summer visit to the municipality of Villanueva, Chinandega Province, where they have conducted their 6th annual day camp for special needs youth, provided physical therapy work, supplied computers to their college scholarship students, met with community and education leaders for ongoing planning for their newest school and provided bikes for first year high school students with long walking commutes to both of the secondary schools the group has built. The most recent, Instituto Augusto Cesar Sandino, opened in March with 2 of the 3 planned wings completed, including a computer room. The organization is still raising funds to construct the final wing which will include a kitchen to process the produce the students and teachers will raise in the market gardens at this agriculture-focused high school.